This recipe was first published in my Eat the Season column in the Wells Journal on 30 January 2014. Certain dishes can magically transport you to places from your past. Whenever I eat chicken satay, for instance, I’m taken back to trips to Malaysia as a child, visiting my mother’s family. And whenever I eat buttery poulet a l’estragon, I’m straight back to France and the first time my father-in-law cooked for me and I discovered Elizabeth David. This tasty pizza is another dish that takes me back to France. But it’s not to the snowy French Alps I go, which is where Tartiflette originates. It is to St Émilion; where I sat with my family last summer in a touristy pavement cafe in the blazing August heat, and where I first tried this rather different take on the classic French cheese and potato bake. I promised myself then that I would make the pizza on my return home. It’s only taken me five months. But actually, I think this pizza is probably suited to the winter months. It is rich and creamy, and can definitely be classed as an indulgent comfort food with its topping of delicious Reblochon, the French mountain cheese from the Savoie region. My recreation back at home worked well. I wasn’t 100% sure the children would cope with the cheese as it does have a rather strong taste, but they gobbled it down greedily. 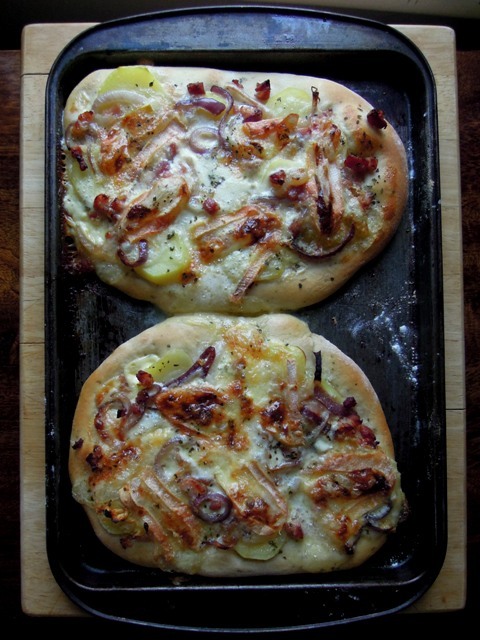 Potato may sound an odd topping for a pizza and this is certainly not a light pizza, but it is just so good with the oozy cheese and caramelised onion, making for a very satisfying meal. While you are waiting for the dough to prove, gently fry the lardons until they release some fat. Add the sliced onion and continue to fry gently until the onion is soft. Stir in the crushed garlic. Uncover the risen dough and punch it back down. Flour the surface again and divide the dough into four balls. Stretch or roll out each ball until you have a thin circle about 22cm across. Place the pizzas onto baking sheets, lightly dusted with semolina. Thinly slice the cooked potato and arrange on the pizza bases. Scatter over the lardons, onion and garlic and sprinkle with the oregano. Thinly slice the Reblochon and lay on top. Finally drizzle each pizza with cream. Bake in the oven for around 10 minutes, until the topping is golden and the pizzas are crispy. Serve at once with a crisp green salad. 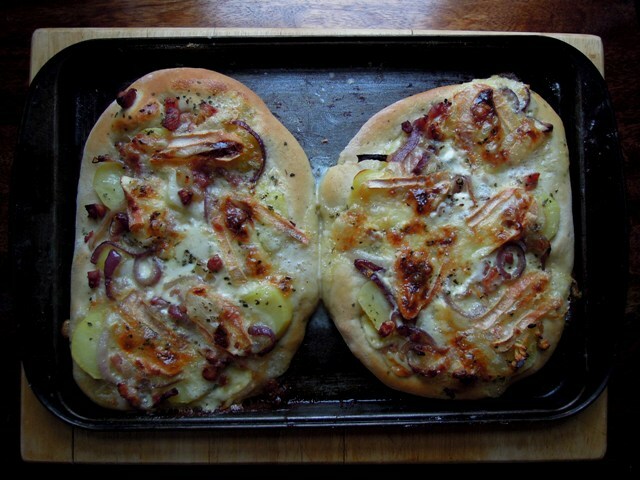 that looks amazing, you can’t beat homemade pizza, but even better with potatoes on too! This looks delicious. I’m been meaning to make tartiflette for ages but I think this pizza would go down better with my boys. And any kind of sharing food is romantic in my book. Thanks for entering it in this month’s Cheese, Please! That looks amazing. I put potato on a pizza for the first time recently and was surprised how nice it was! Oh my! This is amazing! I love potatoes on pizza and one of the nicest pizzas I have ever had was at a meeting in Rome and was topped with potatoes. I think you have just raised the game considerably. Gosh that looks totally amazing! 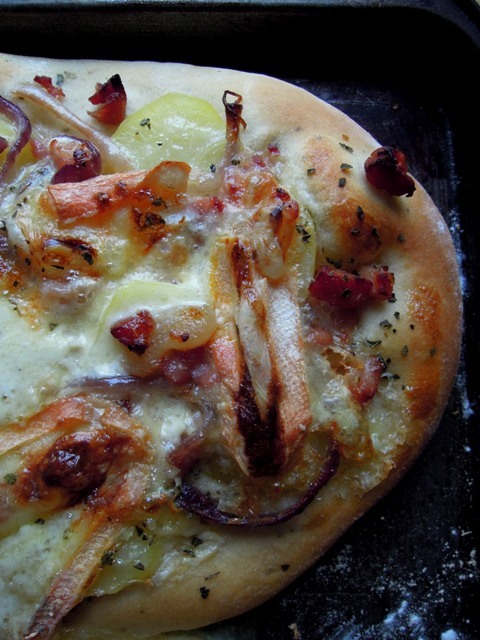 Love tartiflette but hadn’t thought of topping a pizza with it, double whammy of loveliness I’d say. I’ve added potatoes to a pizza quite often, either just as with loads of rosemary and cheese or with a little cheeky chorizo too. So going to try your tartiflette version though before the winter’s out. Wow! That looks delicious. I’ve never through of adding potatoes on a pizza. This version looks tasty. You have such a wonderful set of cultural influences in your family huh? I love the word “tartiflette” it sounds like a character from a Joanne Harris novel! Not been to that part of France but the food is pulling me there! Your pizzas look amazing. I’m hungry just looking at the gorgeous pictures. The onions and creamy topping look lush! What a gloriously simple idea and it looks so good, want to make it right away, but no oven at the moment so will have to wait. no no no! This is two delicious naughty dishes combined. That makes double trouble! Stop tempting me!!! Do you know I’ve never tried a blonde pizza. I really must make one sometime.